The adage “It isn’t what you know but who you know” is true anywhere in the world and can certainly help you get that dream job overseas. However not everyone is lucky enough to have an employer willing to relocated them and if it isn’t your case then the following is for you. If you have read my Ebook on Expatriation, you would know by now how important I consider building online relationships and networking. By the way, if you still haven’t read it, make sure to download it for free by clicking on the link here. There are many ways to grow your network and meet new people online . But with already over 120 million users worldwide, LinkedIn is the web’s largest and most powerful network of professionals and there are many ways to take advantage of this platform to optimize your expatriation endeavours especially when it comes to finding an overseas job. I am going to show you later on five ways you can use LinkedIn to your advantage to find a job anywhere in the world. But first of all, you will need to set up your LinkedIn account (it’s free) in order to add your own details. Very much like a CV, your LinkedIn account will have a profile page detailing your professional experience, current and past positions, your education as well as other sections such as summary, skills, languages, recommendations, etc… Always remember to use relevant keywords throughout your profile on LinkedIn in order to optimize search results within the site and with external search engines. Make it easy for prospective employers to find you! Once you have added the main elements of your profile, I would recommend you to click on “improve your profile” and make sure to include as many details as possible. Secondly, you will want to start adding connections; Click the Add Connections on the top right hand side corner. Check the section – “See Who You Already Know on LinkedIn” and search through your email contacts. You can also connect with current and past colleagues, alumni and anyone with whom you already have a professional or personal connection. Once you have made your first connections, you will want to start building a network of like-minded people around the world. The best way to do it is by joining the various groups on LinkedIn. You are able to join up to 50 groups and there are thousands of groups to choose from. Whether you want to connect with professional photographers in Chile, marketing consultants in Singapore, translators in Finland or other expats around the world, you will be able to found groups of like-minded people all around the world. Once you have joined some groups, it is time to start interacting with its members, by participating in the groups discussions, by asking questions to the fellow group members or even by enquiring about job opportunities in their areas. The point here isn’t to add as many connections as possible but to add valuable connections. The great thing about LinkedIn is that you will be able to find out about job openings in Rosario even before moving to the city and even better, it lets you apply directly to job offers by clicking the Apply Now button. As you can see on the picture below, by applying directly to the job offer, you will be able to add a Cover Letter and Resume. Before applying to any job, I would advise you to ask for recommendations from your current and past employers, colleagues, clients and suppliers; this way your profile will have more impact on prospective recruiters. Another tip is to check who you are already linked to within a company that is hiring, so that you can maybe get referred to the job poster. As well as making connections with individuals, you will be able to follow the news updates of thousands of companies around the world. When you check at a company profile, you will be able to find out if you have any first, 2nd or third degree connections with any of its staff members. If you haven’t got any, try to join some groups where you will be likely to find them, as it is easier to add a connection with someone who is in the same group as you. 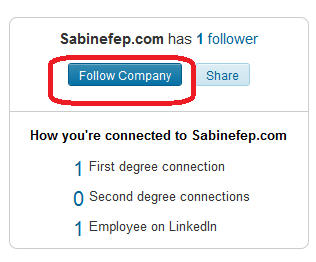 You will also want to click on Follow Company to receive their news updates straight onto your LinkedIn home page. In order to contact directly someone who is not yet a contact, you can either get introduced through a connection, become a connection by joining a group where you will find this person or finally use one of your InMails, if you any. If you still can’t get connected with someone, now that you have their name and job title just search the Internet for their company email address. One of the best ways to get a job is still to send your CV to prospectives employers and make sure to also send a well written covering letter. 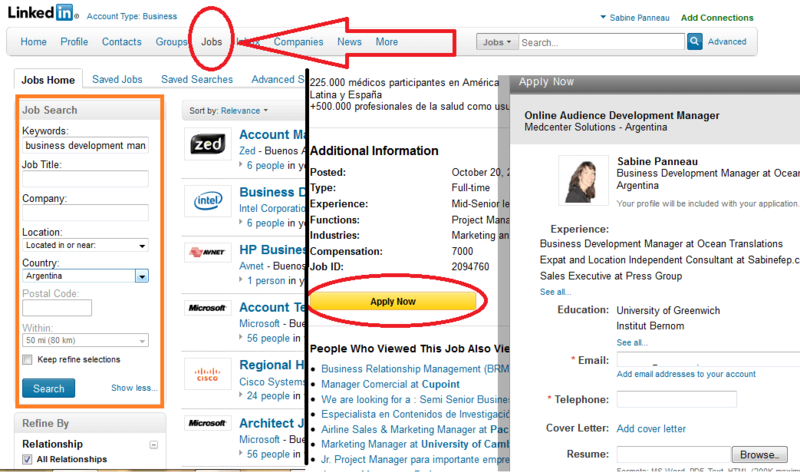 A great tip to promote your expertise on LinkedIn is to add some of the applications features on your LinkedIn profile. 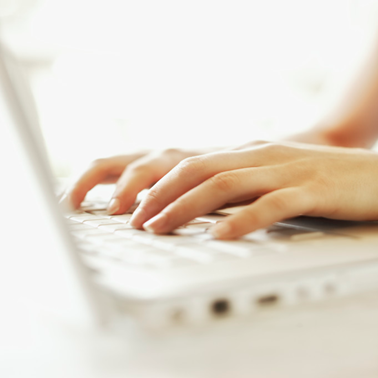 As well as adding the links to your websites, portfolio, you can also directly add your blog posts, your tweets. You can display a creative portfolio or even share your presentations without even leaving your LinkedIn profile. This is your opportunity to shine so make sure this is relevant to your job search abroad. Finally the best way to get noticed on LinkedIn is to promote your expertise by helping and contributing to discussions either in one of the groups you joined or by answering questions on LinkedIn Answers. 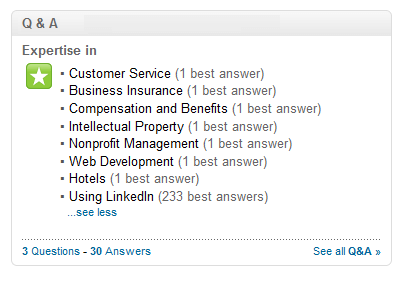 On LinkedIn Answers, if your answer is selected as the best answer, you’ll get an mention on your account. It could be a great way to the attention of a future employer, as they will be able to see all your comments on LinkedIn. These are only 5 of the many opportunities for expats on LinkedIn and in future post I will share with you many other ways to make the most of this powerful platform. As I often say, it has never been easier to live and work anywhere in the world and LinkedIn can become a very useful instrument to your expatriation. If you have any questions or comments about LinkedIn, do get in touch by sending me a message via the Email Me box below or send me an email: sabine (@) rosarioconnection.com and it will be a pleasure to get back to you. To your success in Rosario!